I had eaten at this restaurant the very week it opened. It reminded me so much of the “Taste of the Himalayas” in Pt. Loma that I mentioned it to the manager. He told me that Sanjog Chaudhary, the manager of the Pt. 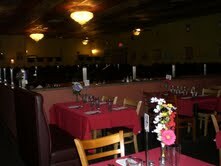 Loma restaurant helped set up this one and that was why the menu, the décor and the service was so familiar. (I did a review of the Pt. Loma restaurant shortly after it opened.) I had not been back to the La Mesa site. I was flabbergasted when I walked inside the restaurant. They had taken over the building next door and now, instead of an intimate restaurant with 12-15 tables there was a huge room with many, many tables in addition to the original restaurant. And it is needed, for the small dining room was filled to capacity during the time Jim and I were there. Again, they have virtually the same menu as the Pt. Loma restaurant, although I am told that there is no connection any more. There is an Appetizer menu; Soup and Salad; Biryani and Momo offerings; Vegetarian Tarkari; Chicken dishes; Lamb Dishes as well as Seafoods; and Tandoori dishes. There is a Side Dish menu and 6 Desserts. Both Himalayan beer and wine are served. 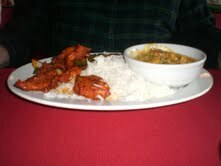 Jim ordered the Veggi Coconut Chicken and the Chicken Chili. He ordered it very mild. (Be aware – their 1-10 category is very accurate. A friend that prides himself in liking spicy food broke out in a cold sweat and thought he would be seeing the paramedics when he ordered a “9” in Pt. Loma.) 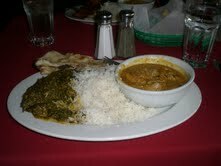 I ordered the Saag Aloo and Chicken Curry. We were served the very tasty Himalayan Daal soup and it was hot. Not spicy. Hot. When we were served our order, Jim complained that his Chicken Chili was cold. Not warm. Cold. The waiter took it back and reheated it. It burned Jim’s tongue on the 1st bite, but it was hot, and very tasty. He enjoyed the Chicken Chili as well. I have no complaints about my meal. It was hot; tasty, and so much was left that I took it home for lunch the following day. The Naan bread is cooked to order and it practically melted in your mouth. The only changes I would make would be to have someone come around and ask us how our meal tasted. Jim had to flag down a waiter to tell him his was cold; no one came around afterwards to ask if it was now ok; no one during the entire meal came and asked us if we needed anything else. The total bill, including the tip, came to $20. My share of $10 plus the $18 I spent at the 99 cent shop made it an enjoyable afternoon. Darn Judi, you should have called me and I would have joined you. I love eating there. OK – now we have a place to eat next time! Judi, you have the perfect name for this review!